Three groups of London South Bank University (LSBU) engineering students were shortlisted for the semi-finals of the Engineering for People (EfP) Design Challenge held this week, with one LSBU team making it into the grand final out of 32 teams from 24 universities from the UK and Ireland. The EfP Design Challenge, run by the charity Engineers Without Borders UK and supported by the Engineering Council and the Engineering Professors' Council, was developed to give first year university students an opportunity to solve global engineering challenges with creative solutions. 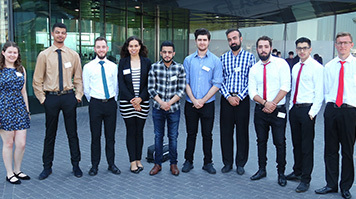 Morteza Etesami, Deborah Diogo, Alex Vanegas and Mohammed Khudadad, a combination of students from the BEng Chemical and Process Engineering and HND Chemical Engineering courses, secured their place in the grand final for their clay pot water condenser and purifier. The design, inspired by Peruvian culture, was a clay pot that evaporates salt water to create clean drinking water for people in Lobitos, North Peru. Gemma Ranson, Gvidas Orlovas, Nathan Corsial, Mechanical Engineering students, were also shortlisted for the semi-final for their water purification design while another team including Mahmoud Berkawi, Samim Rezai, Viktor Cyvas and Mako Rahim, also Mechanical Engineering students, made it into the semi-final for their window-mounted temperature cooler for homes. Fittingly held at the Crystal in London, one of the most sustainable buildings in the world, the challenge was developed in conjunction with EcoSwell and gave more than 4,400 engineering students an opportunity to pitch their ideas to a panel of independent judges, including incoming President of the Engineering Professors’ Council, Professor Sarah Spurgeon OBE, and Director of Engineering and Education at Royal Academy of Engineering, Rhys Morgan. LSBU School of Engineering Senior Lecturer Alessio Corso said: “This year, three teams of students from London South Bank University were shortlisted for the Engineering for People Design Challenge. This is an outstanding achievement when considering the thousands of students that participated in the competition throughout the country. “Our students worked so hard on their projects, so it is wonderful and exciting to see this hard work being recognised by such an esteemed panel of judges. I feel a huge sense of pride at how good the students’ projects are and how well they represented themselves and LSBU Engineering. Dan Craddock, Education Projects Manager at Engineers Without Borders UK said it was a fantastic achievement for the three teams selected from LSBU to attend. "This year the judges commented on the particularly high level of the student entries, so a big congratulations to all involved."